When you own a unit like this GEO travel trailer, you will jump at every opportunity to take it out on an excursion. 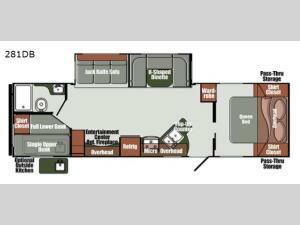 Because of its impressive ability to sleep nine people, you will find that you will never want to travel without this trailer, especially because this unit also houses a premium foam queen-size mattress in the front, private bedroom. The U-shaped dinette and jackknife sofa occupy the single slide, giving the living area extra space for lounging each evening while dinner is prepared in the kitchen.